A few weeks ago I approached Andrew Lewin about the possibility of collaborating on a Doctor Who post to mark the tenth anniversary of the new series' premiere. Rose. Andrew agreed, but, alas, a family tragedy precluded my further involvement beyond the initial idea. So, here's Andrew's wibbly-wobbly, timey-wimey tribute. VWORP! VWORP! It's hard to believe that today marks the tenth anniversary of the return of Doctor Who to television. 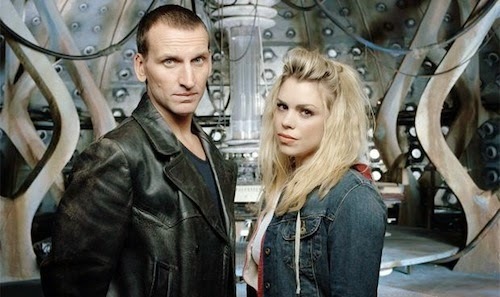 On the one hand it seems no time at all since Christopher Eccleston was bounding around the TARDIS control room, grabbing Billie Piper's hand and urging her to run from the imminent danger of plastic mannequins; but on the other, it seems almost impossible to believe now that there was ever a time when the programme wasn't actually on television, or that during the show's 16 long years in the wilderness a whole generation grew up without the opportunity to get to bond with 'their' Doctor because there hadn't been one. As the clock counted down to that first new episode of the 21st century at 7pm on Saturday, March 26 2005, I remember that my overriding emotion wasn't one of expectation, excitement or exhilaration but rather one of anxiety, angst and apprehension. We'd been waiting for this moment for so long, what if it arrived and it turned out to be dreadful? Or perhaps even worse, what if the show was fine but also completely different from the show we remembered and loved from our own childhoods? There's a reason why "May you get what you wish for" is another of those spot-on ancient Chinese curses. Before that night I remember having been buoyed by the mostly-good omens. I had confidence in showrunner and lead writer Russell T Davies, who had already established himself as a unique, innovative voice in British drama with his hit series Queer as Folk on Channel 4 which contained scenes involving Doctor Who and a guest appearance from K9 that put Davies' genuine Whovian credentials beyond doubt. He'd also helmed the more recent BBC mini-series Casanova on BBC Three, which I remember enjoying a lot and thinking that its little known star would have made a rather good Doctor himself if only he'd turned up in time before the part had been officially cast but who had sadly now missed his chance. Still, no complaints about Eccleston being given the role instead: not the sort of casting we'd expected perhaps, but getting a serious actor of his stature and ability to play the titular Time Lord was a statement of intent that had instantly raised the standing of the show as a whole among both TV executives and prospective viewers alike, since it declared in no uncertain terms: "This is a proper high profile BBC flagship drama, not a kid's show." The only fly in the ointment was the casting of pop star Billie Piper as the assistant. Oh dear. This felt like a return to the sort of embarrassing 'stunt casting' that past producer John Nathan-Turner had been forced to resort to in the old days in an increasingly desperate attempt to buoy up the classic series' ratings in the 1980s. I clung on desperately to the hope that Davies had perhaps seen something in her that the rest of us hadn't had a chance to yet, and hoped against hope that she wouldn't be the Achilles heel that ended up bringing the whole reboot endeavour crashing down. But really the biggest concern as we waited for "Rose" to start was what sort of show Doctor Who would turn out to be. It could hardly just be the same as the old classic series - don't get me wrong, I love the original series to bits, but it would look absurd to modern audiences raised on PlayStation games and glossy American genre TV imports like Buffy the Vampire Slayer. I knew Doctor Who had to evolve and change and grow up, but what would that actually look like in practice? 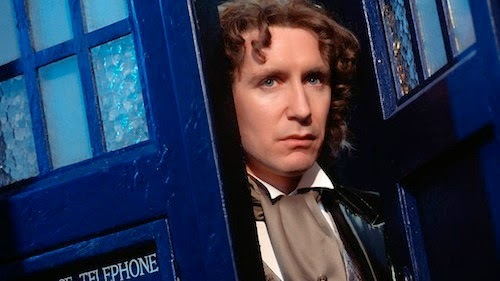 In fact we'd had something of a look at what might happen just nine years earlier when a UK/US co-production made a one-off 85-minute TV movie starring Paul McGann as the Doctor - and it was this spectre which loomed over the imminent arrival of the new series reboot perhaps most heavily of all. The TV Movie (it had no other title) had got our hopes up and yet had proved a terrible disappointment, and when that failed to lead to a full series order it seemed as though that really was the end for our favourite Time Lord. A second chance in 2005 had always really seemed too much to hope for in the wake of the TV Movie's flop, and by this time I'd become so inured to the many false dawns of supposedly substantiated, but ultimately false, rumours of Doctor Who's return that it was very late in the day I actually accepted that the new incarnation from Davies and Eccleston was in fact genuinely happening and not just another attempt at fan wish fulfilment. 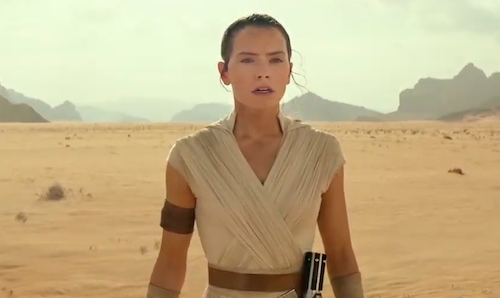 Actually, looking back in hindsight I've come to view the TV Movie as not so much a failure or a crushing disappointment so much as it was a necessary stepping stone between the old and the new. Of course Who fans nitpicked it to death at the time - let's face it, critiquing the show to bits what a true Whovian does best. We hated the tame, conventional orchestrated version of Ron Grainer's iconic theme music; the radically different interior of the TARDIS; the new Doctor and his propensity to kiss his female companion; and that hilariously misjudged climax where the Doctor saves the day by opening the heart of the TARDIS to access the power of the Eye of Harmony and the time vortex itself. And oh dear, oh dear - Eric Roberts as the leather-clad biker Master with not a hint of Roger Delgado and Anthony Ainley's suave gloating and neatly cut goatee to be seen. Transplanting it to the US (in San Francisco in 1999) ended up making it feel too much like just another a generic American action series, a million miles away from the quirky little studio-set show we had loved in our youth. Fans decried all these things, and so despite actually rather good viewing figures for the TV Movie in the UK (nine million) it still didn't get the traction needed in the US to go to series and that was that. They had tried and they had failed to relaunch the show. It hadn't worked; Michael Grade and John Birt's insistence that the show had had its day and was now dead as a doornail had been incontrovertibly proved. Except of course we all know that it's when a Time Lord dies that things actually start to get really interesting. And when the 2005 reboot finally aired, what did we get? A new orchestrated version of the theme tune; a radically different interior of the TARDIS; a Doctor who would become known for not being averse to kissing and even falling in love with his companion; and a first season that culminates in a character opening up the heart of the TARDIS to save the day by absorbing the power of the time vortex itself. When the Master subsequently showed up in season three, John Simm's performance was as radically different from those of Delgado and Ainley as Roberts' had been. The new show really was much more dynamic and action-orientated, and would eventually even film stories on location in America, but crucially at the same time Davies et al also managed to do the one thing that the TV Movie had conspicuously failed to do - retain the core sensibility of quirky Englishness. But credit where it's due to the TV Movie, the casting of Paul McGann turned out to be spot-on especially once he got his teeth into a string of award-winning audio stories from Big Finish Productions; and I defy anyone - even those who hate the TV Movie with a genuine passion - to deny that they didn't punch the air with delight just as I did when McGann made a surprise on-screen return to the role for the 50th anniversary and instantly felt just so right in the part even after all those years in the wilderness. Looked at this way, the TV Movie actually probably got more things right than it got wrong. Okay, there was that terrible misjudgement about implying the Doctor was half-human which as well as being so against the character's mythos is also just such a tired and unimaginative reworking of Star Trek's Spock. More importantly they inadvertently made a terrible mess of the script which was too convoluted for viewers watching for the first time trying to get their heads around an old Doctor and a regeneration into a story that also had to reconstruct the whole TARDIS/Time Lord scenario from first principles. But even here, the TV Movie was instructive as a learning tool: when Russell T Davies made "Rose' he went back to the show's first-ever episode in 1963 and followed the template that still works best of all, by telling the tale through the eyes of the ordinary people like you and me who get whisked away in a police box with peculiar dimensions and wrapped up in unbelievable adventures. In "An Unearthly Child" it had been two respectable schoolteachers called Ian and Barbara whom we had walked alongside into the first of our adventures, while the Doctor himself was some strange, dark and unknowable alien figure about whom we knew little. Similarly, when Davies wrote "Rose" he set us up on a blind date with a personable young department store worker from a south London council estate whose biggest worry up till then was collecting the National Lottery entry money from her co-workers and dealing with her bossy mother and her drip of a boyfriend. Rose and her world were one that we knew deep down inside as being just like our own, so when the Doctor arrived - strange, dark and unknowable all over again - he stepped into our real world as well in a way that the TV Movie never managed or even thought about attempting. Actually what Davies did with the reboot was even cleverer than just learning from the successes and failures of the TV Movie, because at the same time he also extended a straight line all the way back to where the classic series had left off in 1989. That last season had featured a Doctor who was growing much darker, much more inclined to use people to his own ends no matter the cost. He was also mysterious and had hidden secrets lurking behind the surface, suggestions that he wasn't just the happy-go-lucky wandering Time Lord larking around the universe after all. In addition he had as a companion a young streetwise girl from a south London council estate who wasn't at all averse to throwing herself into the melee and battering a Dalek when it was required. 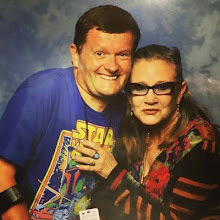 In fact she played a part in the show almost as important as that of the Doctor himself, a world away from the assistants of old whose primary function had been to invite plot exposition by asking the Doctor questions all the time, and then inject drama by screaming when it was time for that week's cliffhanger. Characterisation on top was always nice, but entirely optional. 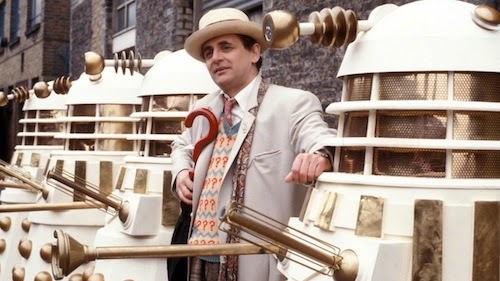 Replace Sylvester McCoy and Sophie Aldred with Christopher Eccleston and Billie Piper and the similarities are obvious; and so are the differences that make it clear how much Doctor Who had changed and grown up in the intervening years. 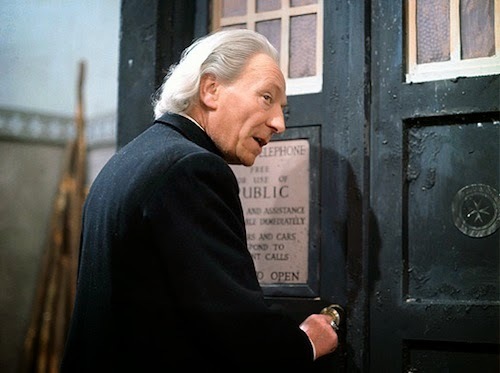 Even so, for long-time fans of the classic show it meant that the reboot was still clearly the same thing deep down, just as the Doctor was always the same character underneath whether he was played by William Hartnell, Patrick Troughton, Jon Pertwee or Tom Baker etc. It was enough to reassure us and calm our fears as the titles rolled for "Rose" for the first time, ten years ago today and yet also no time at all, so that not even an accidental audio incursion from Graham Norton could spoil the moment. It's trendy to downplay Davies' contribution to the show now. These days the triumphant success of Doctor Who sweeping all before it is such an established fact in our lives that it's almost impossible to recall how worried we were back then that it could all go very wrong. Davies made sure that every aspect of the show was precision-crafted to ensure a big ratings success across the widest possible audience demographic, and it is on the back of that success that the renewed longevity of the show still stands to this day. In the context of a show that overall recently celebrated its 50th anniversary, ten years for "New Who" sounds like a very short span by comparison but in itself it's still remarkable in a TV industry where even the biggest hits in the US rarely last longer than eight years, and even fewer achieve that sort of milestone in the UK. And of course there's the international dimension of the success as well. The BBC spent years trying to make the classic series a hit overseas and especially in the crucial US market, but other than a spike of interest in the 1960s with the Daleks and a small cult following during Tom Baker's tenure it never really came to fruition. 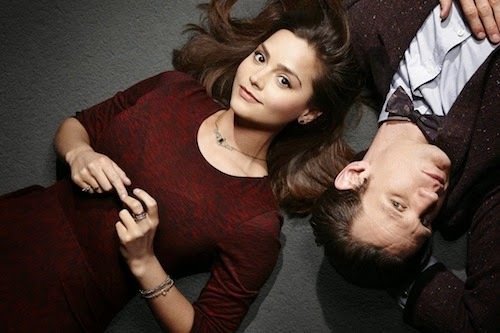 Fast forward to Matt Smith's second season in 2011 and Doctor Who has finally scaled the mountain and become not just a cult hit around the world but a massively popular mainstream one, big enough to get name-checked in US network shows from The Big Bang Theory to Criminal Minds. Against all the gloomy predictions of the naysayers, that appeal seems only to have increased since Peter Capaldi took over in 2014. That's really genuinely still something that blows my tiny little mind to this day, especially since we know that BBC Worldwide tried to block the making of the 2005 relaunch on the basis that they saw no prospect of any significant international sales of the show. It's anecdotes like that which make me yearn for a world without TV network executives making clueless calls on things they can't and never will understand. Fans of course know too much, more than is good for us on the whole, which is why we get so critical and nit-picky about the things we love when we so earnestly want them to be a big success and hence we panic a little when we think it's about to go wrong. I'm as guilty as the next person such as with all my recent worries about where the show was going under Davies' successor as showrunner, Steven Moffat. I really should learn to chill out and relax more, because what Davies and Moffat have proven in turn is that Doctor Who really is in the hands of not just supremely talented people, but the right supremely talented people for the job who wholeheartedly share our love for the show. With that sort of foundation there's no reason why we won't be celebrating 20th anniversaries of the reboot, and the 60th and 75th anniversaries of the show as a whole in turn. After that, we'll be looking ahead with almost insane confidence to the centenary. Such a thing sounds ridiculous to contemplate, doesn't it? And yet back in 1963, just the suggestion that the show would last even 13 weeks was almost as absurd. 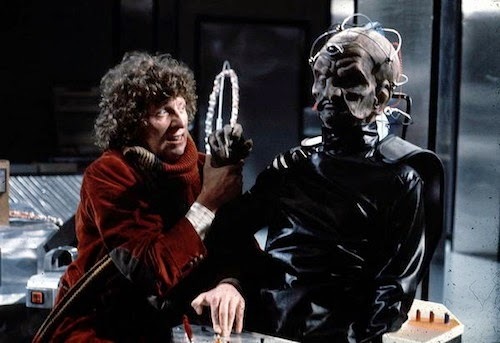 The fact that it made it to its first tenth anniversary in 1973 was a huge surprise to everyone, and that was before Tom Baker - surely the quintessential Doctor Who - even entered the fray. We had no idea back then just what the show would become, and perhaps even now in 2015 we still are only just getting our collective heads around it. It's all a very far cry indeed from those nervous moments leading up to the return of the show ten years ago, and yet weirdly I still get that same sense of anxiety, angst and apprehension to some degree every time a new episode is about to begin. And you know what? I hope I always do. As for Billie Piper - who knew she'd turn out to be such an excellent actress and a bone fide star to boot? Well, Russell T Davies did, obviously, and he had the courage to back his convictions knowing she'd knock it out of the park. He trusted her, and we trusted him, and she (and they) actually pulled it off. By the time Rose accepted the Doctor's offer and took his hand to race into the waiting TARDIS for the first time at 7.42pm on Saturday, March 26 2005 there was no longer a single doubt in my mind that she - and we - were in for the trip of a lifetime. A decade later and we're still on it. Miracles and regenerations do happen after all, it turns out. Happy tenth anniversary, everyone.